I like those pics of the flight decks you posted. How much and from whom? The manufacturer is "Shipyard Works". Looks like you can find them on eBay for around $43 USD. Thanks for the info, looks like a really good deal. I'll be ordering it soon. Are there any photos that clearly show that there were boats under the stern boat platform on either Sho or Zui before mid-war modifications? I have the Miyukikai plans, but they have been wrong in other areas. Also, were the boat cradles removable, or could they be folded, to allow better access? AFAIK, boats were stowed under the stern boat platform. 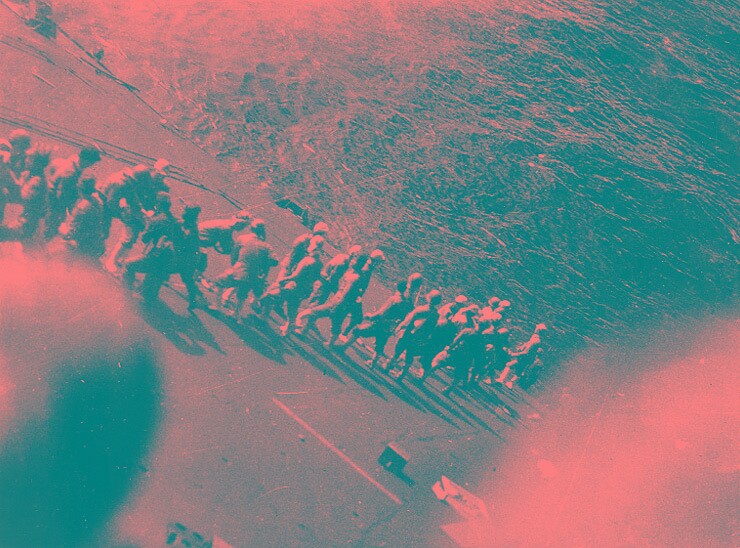 Best shot comes from a pic taken after Shokaku took damage at the Coral Sea. View is from the starboard side, upper boat deck, looking aft and across toward port. In the middle, you can see an accommodation ladder stowed and lashed to horizontal braces extending outward from the upper boat deck. You can sort of make out another boat under it. Thanks, Dan, but I meant boats under the upper platform. Your photos seem to show a compartment of some sort that supports the upper boat deck. I'm beginning to think there were no inner boats and all were hoisted by block and tackle from under the flight deck. The Miyukikai plans show the boats, but they also show pole supports for the upper platform between the inner and outer boats, only there are no tracks or rolling cradles indicated for maneuvering the boats around the poles. The Grand Prix book depicts the cradles as bolted to the deck and with sway braces, so they weren't easily movable. Did you also notice that those plans indicate the upper boat deck was planked? I know what you are referring to, Mike. There's a companion shot (below) in which you can see the keel of that other boat below the accommodation ladder. Like you, I do puzzle about the uprights. Maybe those boats were on a swivel type turntable, so they could be backed out. I'll look at the Miyukikai plans tonite, I hope. Hey Dan, what's your take on the added fuel tanks on the starboard side of Zuikaku? I think they might be AV gas or ? Not sure if I should add some Evergreen scratch or not? Extra protection over the AV-gas tanks added in mid 1944. I believe they are steel plated blisters backed by concrete. Image lifted from on line. Ok, Mike, I took a long look at the Miyukikai plans, along with the Hara Shobo plans. I'm stumped. I agree that there are support columns on either side of the lower, central boat positions, as well as more support columns down the centerline. There's no rails or and obvious way to move those boats on the face of it. I believe the same issue pertains to Soryu, Hiryu & the Hiyos . The only mechanism that makes sense to me is if the upper boat deck was not solid plating directly above the boats, but more like removable grates. That way, use could be made of the boat cranes directly overhead, to move the gratings aside, then the raise the boats up and out. I can't think of another solution. Manhandling large boats off the chocks and threading them through the columns seems most unlikely. I can't agree with the removable plating idea because they'd still have to contend with the support framing, or having to move upper boats to get to the lower ones. There is also that issue with the planking shown on the Miyukikai plans. Does that show on your other plans? File comment: Planking on both Miyukikai plans. Some American ships had cradles on racks with wheels, so the whole thing rolled around, or could be fixed to the deck when stowed, but I haven't seen any indication that the Japanese did that. OTOH, if there were no inner boats, the outer boats were already using the overhead cranes and tracks, with no need for other handling equipment. The only solution I can think of would be to arrange the lower, inner boats in an athwartship setup on dollies with wheels, which is unlikely considering your photo. Without proof of their being there, we may have to just install the inner boats and hope nobody notices. I suppose wheeled cradles or dolleys were possible, though those longer launches weighed 7-9 tons, depending on length. I did not look again at the Miyukikai planset. I was sceptical of wood planking in that area until I reviewed my photos yet again. Below is a photo of the upper boat platform looking forward and to starboard. The photographer was standing on the centerline. I have to say, it does look like there is at least some planking at middle, bottom. I am surprised. I thought linoleum or treaded steel, for sure. 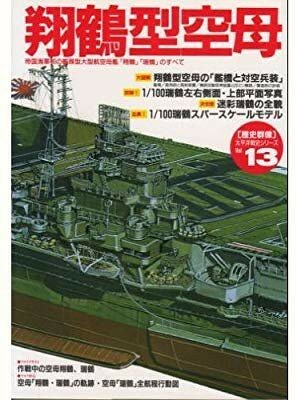 Hey Dan, I noticed the Fujimi 1/350 Zuikaku 44' kit has the aft rocket launchers on the same deck as the a/c engine-run hangers. Should they be a deck higher, closer to the flight deck? Are there plans available online for the Zuikaku 44? I can't find them if there are. Front aviation fuel armor?.... Selling on Amazon wants 10k for this magazine, which is just out of my price range. Found this online, supposedly crew dumping ammo from the Zuikaku though it's been rotated a bit. Only 10K? Jeez. Well, that doesn't come with '44 plans, either. No, no online plans. Some illustrations with fuel tanks only. See bottom of page 12. Harpy - If "online source" means a place to find them online, try here: http://www2.odn.ne.jp/miyukikai/ If you mean posted online, you're pretty much SOL. Thanks Mike. Unfortunately, they are sold out of plans for the carrier. I did pickup the eBay book though.